There are a number of excellent reasons to use weightlifting charts. First of all, they can help you keep track of your progress. Secondly, they can help tell whether or not you are getting stale. For example, if you look at your weightlifting chart and see that you have been doing the same exercises using the same weight for the same number of repetitions, you know that something needs to change. Self-awareness is one of the primary benefits of weightlifting charts. As mentioned, working by the chart can help you become more aware of your weights and repetitions. However, it can do much more. Following weightlifting charts can make you conscious of whether or not you are working your entire body. Here's an example: The pectoral muscles or the muscles of the chest are often referred to as the "vanity muscles." As such, they tend to get overworked, otherwise known as "hypertonic," whereas the muscles of the upper back get weak or "hypotonic." What does a hypertonic chest and a hypotonic back look like? Since the pectoral muscles pull the chest together, and the erector spinae muscles pull your shoulder blades together, both actions are important. Since many people work at offices throughout the day, they tend to sit hunched at their desks. If they go to the gym and work in the same hunched posture they use at work, it becomes an exercise in futility. Weight training exercise makes a dramatic change in the human body. Some people believe that this change is more remarkable than any other exercise form. Remarkable change requires a remarkable effort. Just as you might use a food chart when you are on a diet, weightlifting charts keep you faithful and accountable to your fitness program. No matter how truthfully you try to evaluate your workout, and no matter how hard you attempt to push yourself, you are your best memory keeper. Additionally, you will have the added benefit of seeing a plateau developing ahead of time. People often fail to get the results that they want, because they are not working as hard as they need, or at least as hard as they think they are working. Sequencing is one of the most important aspects of weight training. 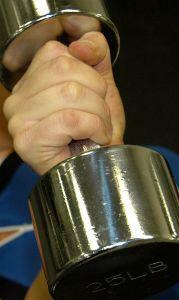 In general, most trainers will advise you to work the larger muscles before the smaller ones. They'll also tell you to breathe with the movement, rest a day between weight training sessions, drink lots of water, hold your belly tight and exercise using good form. If you are an exercise expert, all of this is easy to remember. If you are new to the wide world of working out, you may find yourself overwhelmed. Eventually, the workout routine will become logical. When this happens, you will remember the sequence. Till then, it behooves you to a follow a weightlifting chart. Here's why. Let's say that today is your day to do a full chest workout. The pectorals rely on the assistance of the triceps in order to perform the required extension movement. However, the triceps are not very strong. They can only supply so much assistance, without going into fatigue. The pectorals are much stronger. If you were to work your triceps prior to your pectorals, when it's time to work your chest muscles, the triceps would not have any strength left to offer assistance on a bench press or push-up. In summary, fitness, especially weightlifting, works on principles of accuracy and accountability. Good form, along with well-designed weightlifting charts, help you get there.